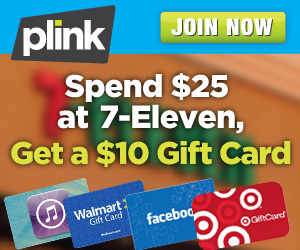 Are you signed up with Plink to get this great deal at 7-Eleven? All you have to do is spend $25. That’s easily just topping off your tank (spending at least $25 — which is NOT difficult to do these days). Then, you will be eligible for a FREE $10 gift card! You will be rewarded points, which you can redeem to purchase an Amazon, iTunes, Target, Walmart….or other store’s gift card — for free! Just sign up, link your card and spend $25 at 7-Eleven by July 21st to get in on this offer (but why not do it tomorrow, since you can get that free slurpee). Shop at Subway using the same debit or credit card you linked to your account.